Now that my kids are getting older, I find that I spend most of my days going from school to playgroups to dance classes to gymnastics classes. I don’t really mind it so much, but the two other kids that get dragged along and have to wait outside of said classes tend to grumble and groan about it. They just get so bored! 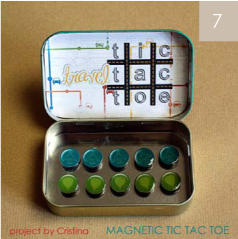 Enter my newest craft project… magnetic tic tac toe. It is small enough that I can just stick it in my purse and then pull it out as needed. Now the wheels are turning as I try to come up with other magnetic games I can make/store in a tin so I have some variety for the kids. Thanks Scrap Matters! This fall puzzle tree is a great craft to help transition your kiddos from their Halloween candy comas into a Thanksgiving state of mind. My husband is Canadian while I am American and I am always trying find a way to sort of bridge our two Thanksgivings. Canada’s is the same day as Columbus day (beginning of October), which means we have about a month between the two holidays. 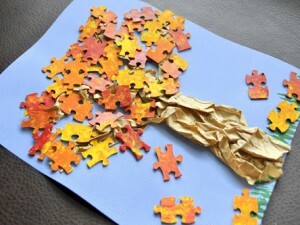 I found this craft a little too late for this year, but next year I am going to do this puzzle tree, only use bigger puzzle pieces and have our tree be the length of a wall instead of a piece of paper. Then, every day or so between Canadian Thanksgiving and American Thanksgiving, we will sit as a family and say one thing we are each thankful for. We will write them on our puzzle pieces and place them on our tree. By the time American Thanksgiving rolls around we will have quite an amazing Thanksgiving Tree! Thanks for the idea PBS! This looks so fun! 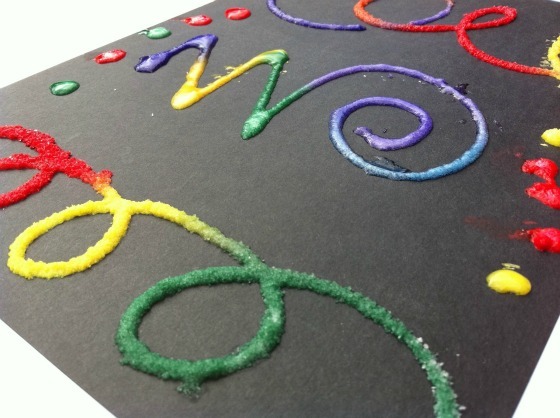 You pour salt on glue and then drop watercolor paint or colored water on it and watch the colors spread across the design. This would be a fun craft to do for the 4th of July. Kids could make flags with red, white and blue colors. Thanks One Perfect Day! I know that Halloween is over a month away, but October seems to come and go before I have even had a chance to decorate so I thought I would start early this year and really take the time to enjoy the holiday. 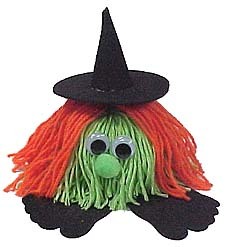 So from now until the end of October, I will be posting any great Halloween crafts I come across so I can share them with you. I hope you enjoy! The first Halloween craft I want to share are these adorable yarn bugs. My kids are going to love these. Thanks to Making Friends for the great idea! There are also Pumpkin and Spider yarn bugs as well. Here are the tutorials for those.